Geofences are zones that can be used in event notifications. For example, you might want to be notified when a device enters or leaves a particular zone. Each geofence has a "fence width" property. This value (in meters) defines how far inside or outside of the fence a device must go before a particular event notification is triggered. Line geofences are particularly useful if you want alerts to be raised if a device does or does not conform to a particular route. Click on the map to begin drawing the line, clicking to place a point. To finish, click the end point. If you want the geofence to be visible to sub-tenants of the tenant selected in the previous step, check the "Applies to above tenant and sub-tenants" option. Click on the map where you want the centre of the circle to be and drag outwards to expand it's radius. Click on the map where you want the the first point of the polygon to be and click at each vertex. Click the first point again to join up the polygon. You can add more points by dragging the transparent handle in the middle of two points to the desired location. Once you've created a geofence, you can add tags to it. You might want to do this to indicate a speed limit or risk level, for example. Geofence notifications can be used to send a notification or raise an alert when a device is inside or outside a geofence or when a device enters or leaves a geofence. Creating a notification for one geofence is rather simple but multiple geofences may be used as well. 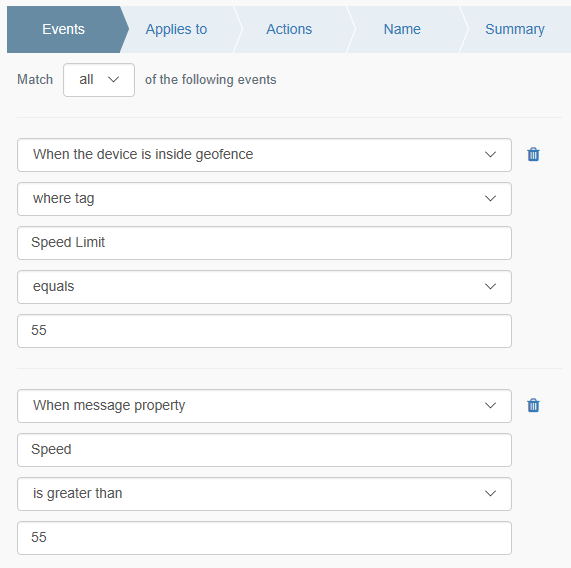 If using the notification “When the device is inside geofence” with multiple geofences, the notification will fire if the device is inside any of the geofences selected. 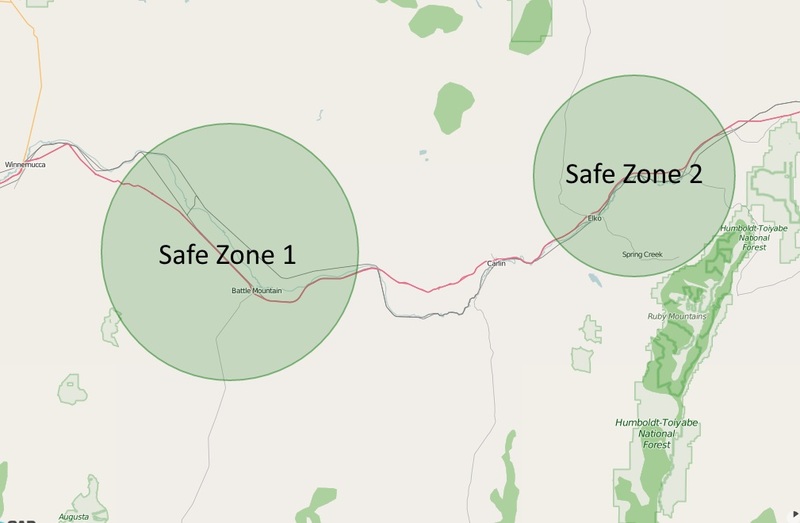 Using the inside rule and selecting both Safe Zones shown below, the rule would fire when the device reports from inside Save Zone 1 or from inside Safe Zone 2. If using the notification “When the device is outside geofence” with multiple geofences, the notification will fire if the device is outside all of the geofences selected. 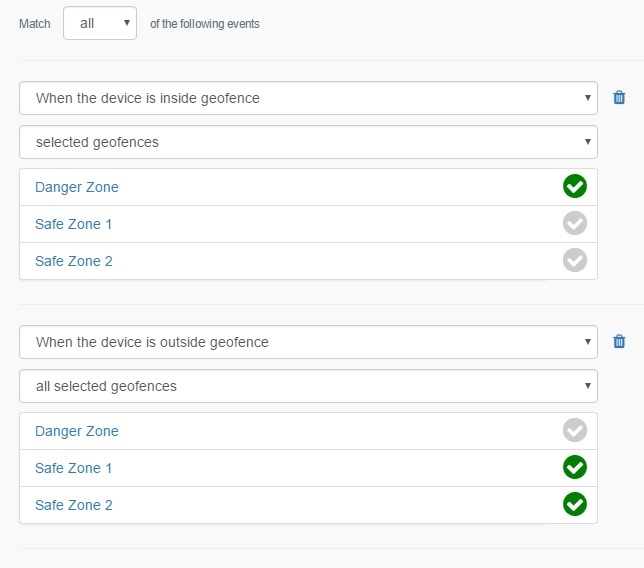 Using the outside rule and selecting both Safe Zones shown above, the rule would fire when the device reports from outside both Safe Zone 1 and Safe Zone 2. Doughnut shaped goefence notifications can be configured using multiple geofences. 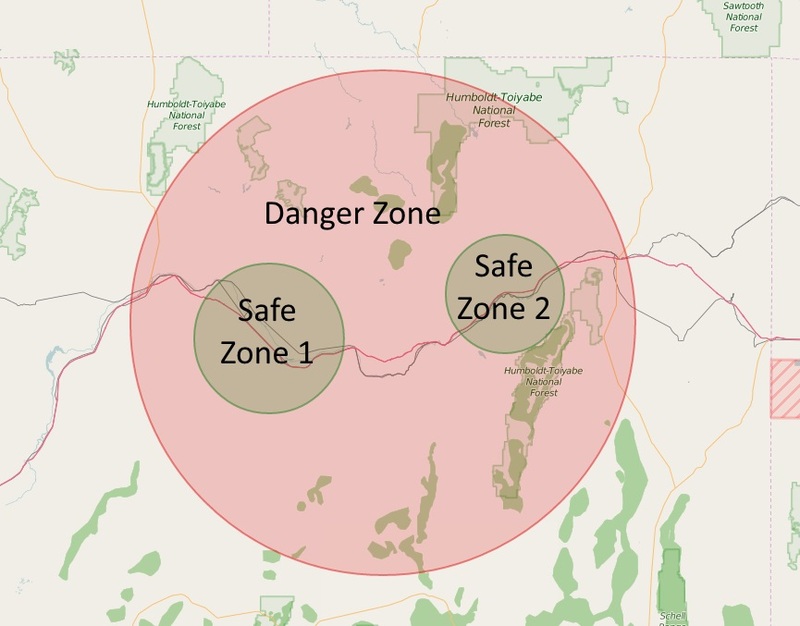 Consider the example shown below with two Safe Zones inside a Danger Zone. A rule can be configured to notify whenever the device reports from inside Danger Zone, but outside of one of the two Safe Zones inside.